Planetary geologist Phil Horzempa returns with a new post on Mars landers planned through 2018. It doesn't seem to be widely known, but, China appears to be planning to send a lander to Mars in 2016. As with most Chinese space projects, hard facts are scarce. A presentation gives some sketchy details of the mission. From this report we are able to glean the general outline of the mission and the fact that China actually has plans for a Mars exploration program. Figure 1. Chinese orbiter and lander aeroshell. This diagram shows the lander aeroshell and the orbiter that will carry it to Mars (Figure 1). Upon arrival at the Red Planet, the orbiter/lander combination will enter a capture orbit while still attached to each other, as was done during the Viking missions. 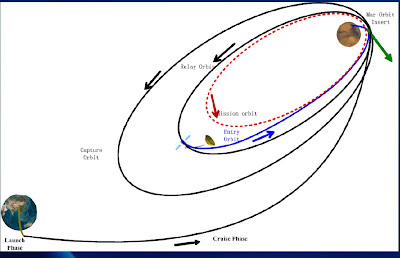 The dual craft will then enter a lower orbit from which the lander will descend to the surface (Figure 2). 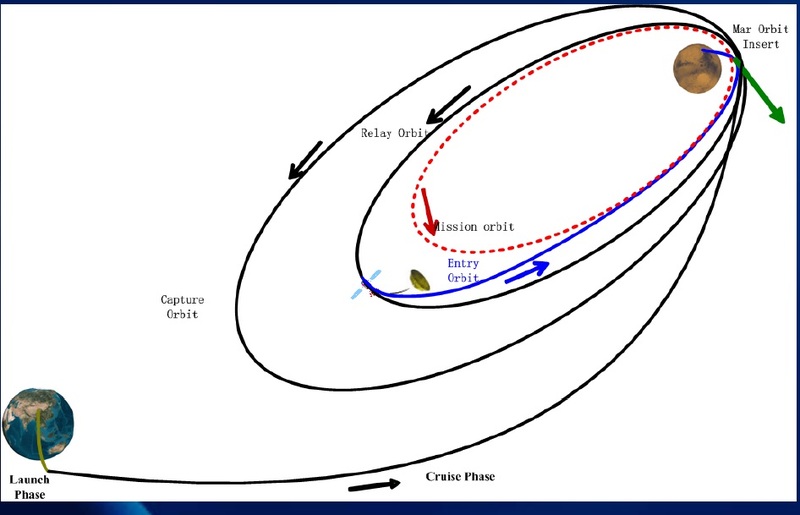 As shown in the diagram, the orbiter will serve as a relay for the lander before it maneuvers into a lower science orbit. The Entry, Descent and Landing (EDL) sequence is shown in Figure 3. Not much detail is revealed, but in brief, it seems to be a typical EDL sequence followed by most Mars landers. This report indicates that the landing will be semi-soft. The only clue as to what the lander may look like is shown in a cut-away diagram of the aeroshell. (Figure 4) Apparently, it will be battery-powered, with a 3 – 5 day life on the surface. 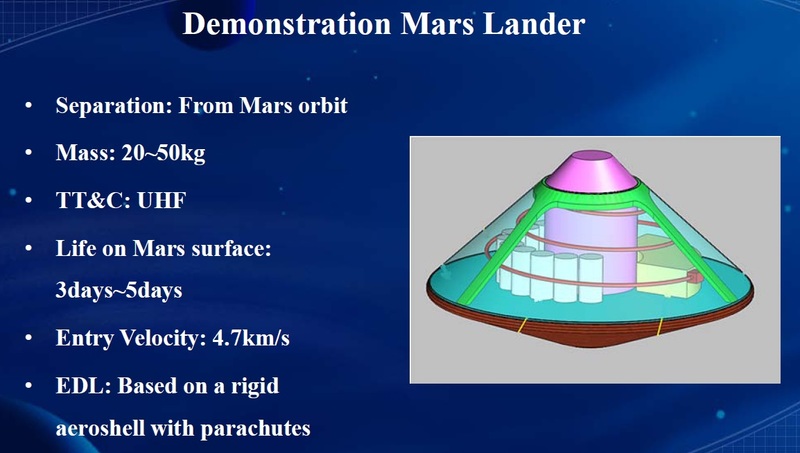 The lander will have a mass of only 40 – 100 lb. This will leave little capability for any science instruments. The available diagrams do not clearly indicate whether there will be a separate lander within the aeroshell, or if the aeroshell structure itself will double as a lander. Figure 3. Chinese entry, descent, and landing sequence. Figure 4. Chinese Mars demonstration lander. 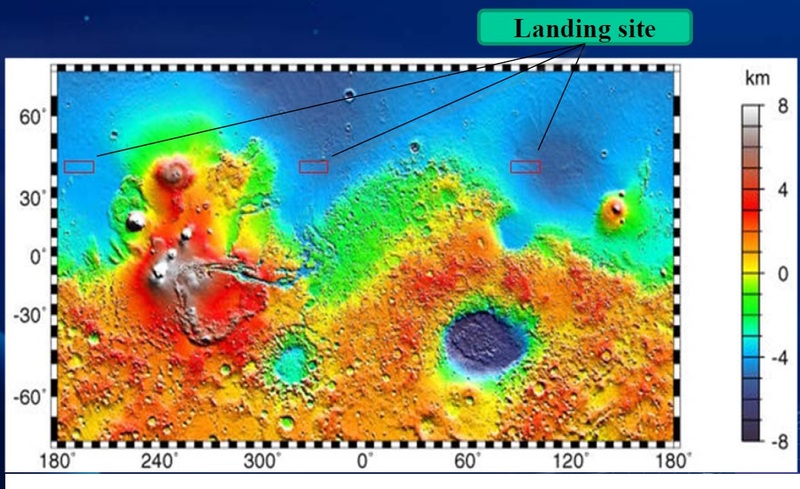 In addition, the report indicates 3 candidate landing sites for this mission. They are all at about 45 degrees N latitude, which may be dictated by the orbit of the carrier spacecraft. All 3 sites are targeted for the plains of Mars possibly to find terrain that is as amenable as possible to a safe landing (Figure 5). Even though this may be a simple hard lander, it would still be a great leap forward for China's space program. This report also outlines a long-term Mars program that includes a Rover and Sample Return. (Figure 6) The unmanned Chang'e lunar program has shown that China is willing, and able, to follow through on fulfilling long-range plans. If it does the same with its proposed Mars program, then we could see another major player in the exploration of the Red Planet. Figure 6. 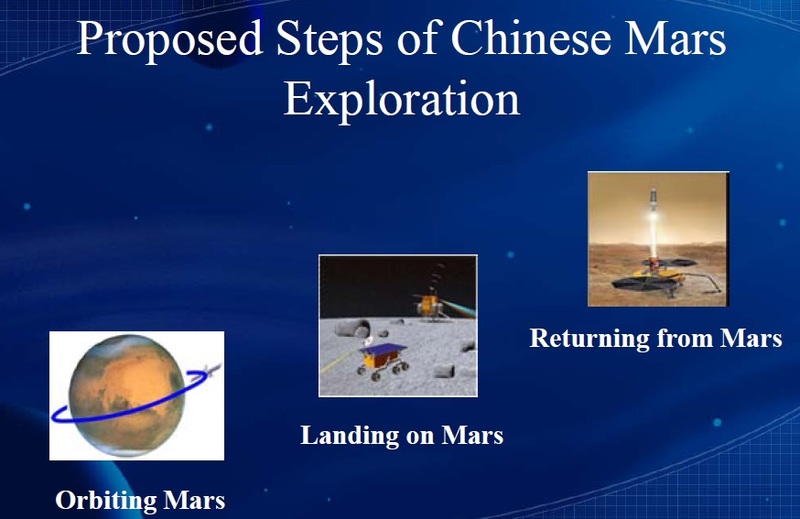 Proposed Chinese Martian exploration program. 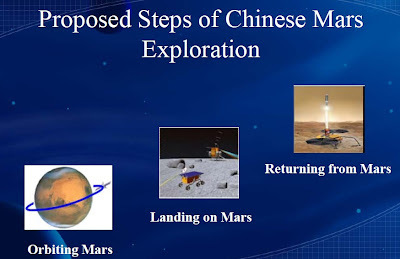 In fact, China may be laying the groundwork for its Mars program in the Chang'e program. Later this year, the Chang'e-3 mission should deliver a rover to the Moon's surface. In 2017, the Chang'e-5 spacecraft is set to return samples from the Moon. In preparation for that mission, the Chinese have recently announced that they will conduct an Entry Vehicle test flight in 2015. This qualification mission will fly a copy of Chang'e-5's entry capsule attached to a bus derived from the Chang'e-2 lunar orbiter. The mission profile is not clear, but it can be imagined that the bus/capsule combination will fly out to at least the Moon's orbit before returning to the Earth. This will allow the capsule's thermal protection system to be tested at velocities encountered by spacecraft returning from the Moon or Mars. As to whether the 2015 bus/capsule spacecraft will perform a return from lunar distances without approaching the Moon (as in the Soviet Zond 4 mission) or whether it will loop the Moon (as with the Soviet's Zond 5) is an open question. 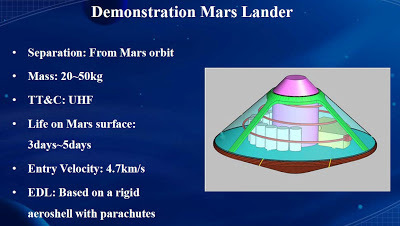 Not only will this test the Chang'e-5's capsule design, but it will serve as a pathfinder for China's 2016 Mars EDL capsule and future Martian sample-return craft. The 2018 Mars window will see the launch of the joint ESA/Roscosmos Exomars 2018 rover/lander. A recent status report has revealed new details of the Russian Descent Module. This lander is set to deliver ESA's rover to the surface of Mars. 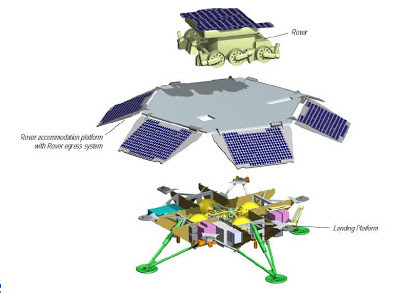 The report shows the Russian surface platform to be a 4-legged (or 3-legged) rocket-powered lander. This is very similar to the design of the Viking and Phoenix soft-landers, as well as the descent stage of the Soviet advanced Luna landers, e.g., Luna 16. The design of the Russian lander appears to be somewhat fluid . In an earlier post , Van showed a version of the lander that appears in several illustrations from this newest report. (Figure 7 to 10) The lander option in the upper-right of this diagram is especially intriguing. It shows a descent module with legs that are folded upward after landing. This would lower the platform so that the rover could more easily egress from the lander. Figure 7. ExoMars and Russian platform entry module. Figure 8. 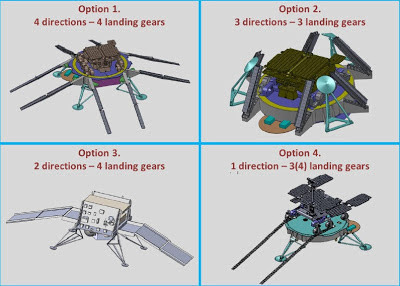 Possible designs for Russian-designed lander. Figure 9. Detail of one possible design for the Russian supplied lander. Figure 10. Entry, descent, and landing plan for the ExoMars rover and Russian lander. However, a variety of options are still being considered by the lander contractor NPO Lavochkin. As Van reported in that earlier post, the Russians plan to have a full complement of science instruments on their Descent Module. Even if there were no rover on this mission, the Russian instruments would make this a productive mission. What makes the ExoMars 2018 project a dicey proposition is the fact that the last Soviet/Russian rocket-powered landing occurred with the Luna 24 Moon landing in 1976. The Russians have no recent experience with this type of machine. (Note that the Soviets soft-landed on Venus as recently as 1985, but the lander deceleration was entirely through atmospheric drag.) However, the upcoming mission of Luna 25, in 2016, is set to fly a controlled soft-landing on the Moon. If successful, this may help ease any concerns about Russian capabilities. Mars' environment is different than that of the Moon, but the final maneuvers leading to a soft-landing on these worlds is similar. Thus was the American lunar Surveyor soft-lander a pathfinder for the later Viking spacecraft. ESA has indicated that its 2016 EDM (Entry, Descent and Landing Demonstrator Module) lander will play a role in preparing for its following ExoMars effort. 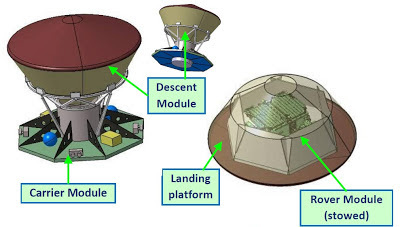 To quote ESA's website, “ EDM will land on Mars to prove key technologies for the 2018 mission.” This is telling, and brings up the issue of how, exactly, the tasks required for building this lander will be divided between ESA and Roscosmos. How much of the technology developed for ESA's EDM mission will feed-forward to Russia's 2018 Mars lander? Will ESA share its software and/or hardware developed for the EDM? In ESA's latest Quarterly report, there is this quote, “ESA will provide the computer to manage all operations except surface platform operations. The surface platform, being a Russian responsibility, will be operated using a Russian-supplied computer. The Rover will also feature an ESA-provided computer dedicated to Rover operations.” Safely landing on Mars is perhaps the most difficult maneuver in the field of planetary exploration and reliable software is an important aspect. This division of computer labor could be a source of concern. 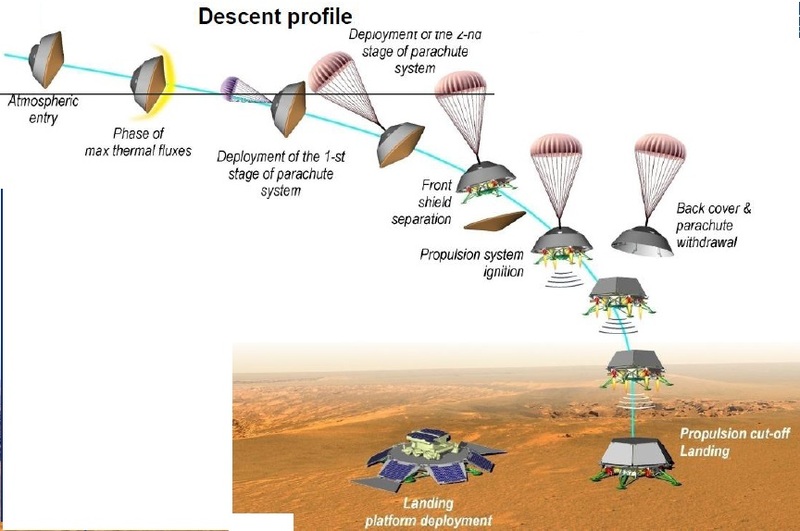 ESA's EDM Mars lander, referred to above, will use yet another landing technology. In lieu of airbags or landing legs or a sky crane, it will utilize a crushable structure to attenuate the force of impact. (Figure 11) The EDM will also use a set of 9 thrusters (3 clusters of 3 rocket engines each). They will not be throttled as were those on Surveyor, Viking, and the MSL Sky Crane. That capability is expensive to develop. Instead, the EDM will operate its thrusters in pulse mode, the same method utilized by the Phoenix lander in 2008. This brings us to Phoenix-2, aka, Insight, NASA's contribution to the international fleet of landers in 2016. It is now in Phase B, with construction set to begin in 2014. However, every project has growing pains and one is revealed through comments in NASA's newest budget proposal. Specifically, the document states, “If: Growth of lander avionics and payload electronics continues to strain volume of thermal enclosure, Then: The heritage design of the thermal enclosure and aeroshell is at risk. The project cannot grow the size of the thermal enclosure. 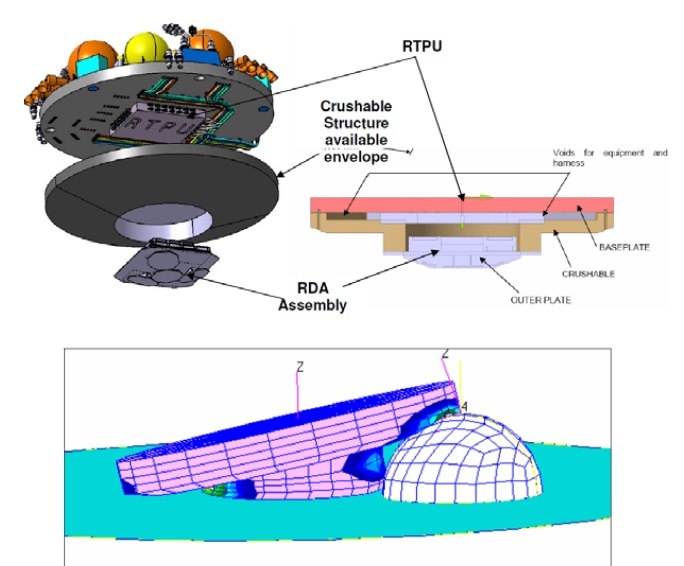 Instrument teams are working to close trade studies that will establish the baseline for payload electronics configuration, and spacecraft team members are working closely with instrument teams to identify and analyze overall configuration options.” One of the cost-saving aspects of Insight is the use of the proven Phoenix lander design. However, it appears that they are having difficulties in stuffing 11 pounds of instruments into a 10-lb bag, so to speak. We will see four spacecraft utilizing four different landing designs heading to the Red Planet in 2016 and 2018. It will be fascinating to see the results of this fleet of ships. 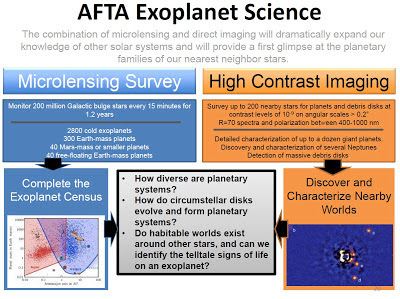 However, the team also examined uses of the mission for exoplanet studies. Here, the mission could conduct distinct surveys. 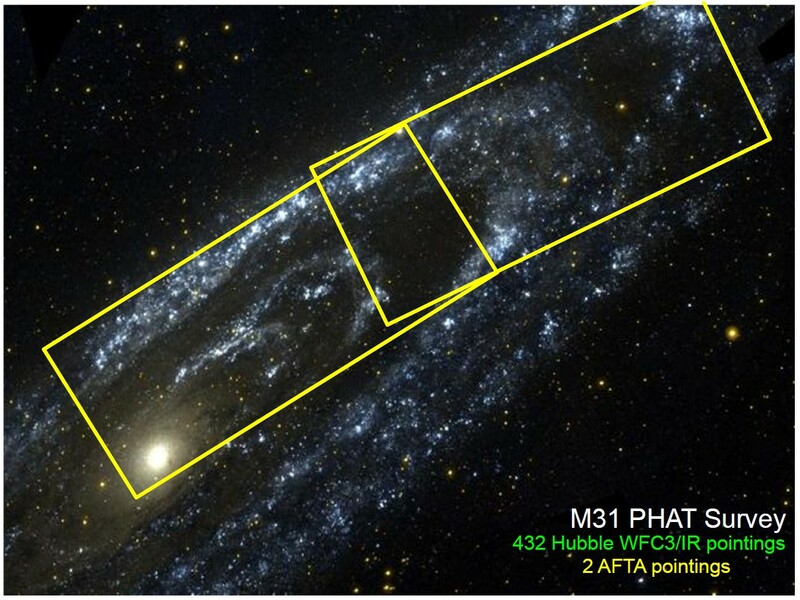 Using the same camera-spectrometer as the astrophysics study, the telescope would spend long periods staring towards the center of our galaxy. The instrument would occasionally catch an exoplanet transiting in front of a background star. The gravity of the planet would distort the image of the background star, revealing the mass of the planet. Operating in this mode, the telescope would be expected to detect an estimated 3,000 or more planets. Where the Kepler telescope specialized in detecting planets close to their stars, this mission would specialize in detecting planets further out (including those floating in space between stars). The study team also is proposing that the telescope be equipped with a coronagraph. This instrument would use a shade to block the bright light of nearby stars, permitting direct imaging of Neptune and Jupiter-class planets. 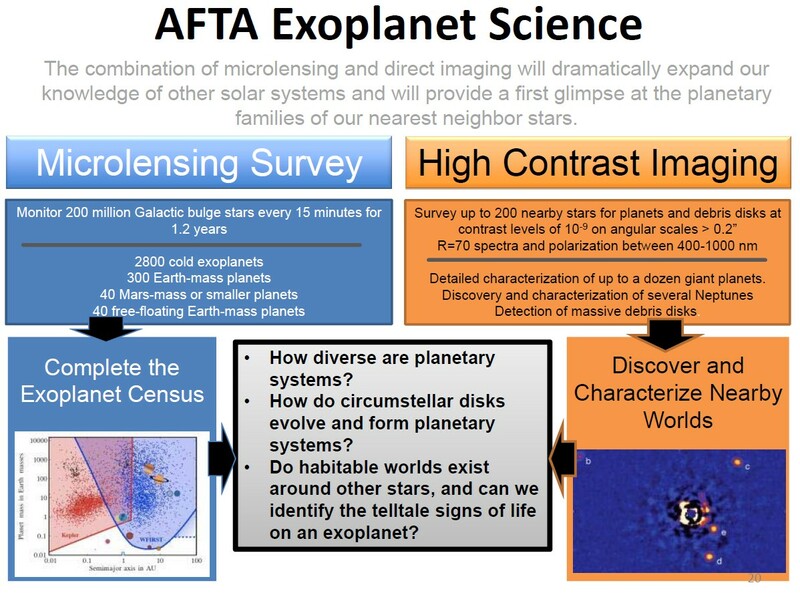 Phil Horzempa has written an excellent summary of the exoplanet capabilities of this proposed mission at the Space Review (Exoplanet capabilities of WFIRST-2.4). (Phil also has contributed to this blog.) I encourage you to read his story. In the meantime, here are a couple of slides from a summary presentation on the proposal to whet your appetite. You can see the entire presentation here or read the study team's report here. If the mission flies, it would be launched sometime in the early 2020s. The team did not make its cost estimate available. Later this month, NASA's administrator will decide whether or not NASA will continue to study this option. 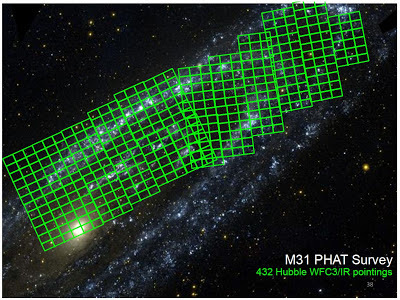 One of the exciting capabilities of WFIRST 2.4 is that it would have a much wider view than the Hubble Space Telescope while retaining Hubble's resolution. The following two images show how two WFIRST 2.4 images would cover the same area that would require 432 Hubble images.